The scientists stress that the condition of these whales "is poor and declining"
VLADIVOSTOK, April 2. /TASS/. French oceanic researcher Jean-Michel Cousteau plans to arrive in Moscow on Wednesday and then set off for Vladivostok to visit orcas and beluga whales kept in the Center of Adaptation for Marine Animals in the Russian Far East Region dubbed a "whale prison," the Ocean Friends marine animals rescue team told TASS. The Whale sanctuary project, an organization in which Jean-Michel Cousteau is taking part, said that the French explorer had received permission from Russia’s authorities and planned to visit the country this week to join an effort to rescue and rehabilitate orcas and beluga whales kept in the facility in Srednyaya Bay. "On April 3, Cousteau will come to Moscow and on April 4 he is set to meet with [representatives] of the Russian Natural Resources Ministry and then head to Vladivostok, where he is due to arrive on April 5," said a spokesman for the Ocean Friends group, which maintains contact with Cousteau’s team. Jean-Michel Cousteau, who is the first son of famous ocean explorer Jacques Cousteau, and his team plan to meet with Russian officials and hope to start joint work on assessing the condition of the mammals together with Russian scientists and researchers. Whale sanctuary project experts were among over 30 international scientists from around the world, who signed an open letter to Russia’s authorities asking them to provide access to orcas and beluga whales kept in the Center of Adaptation for Marine Animals in the Russian Far East. 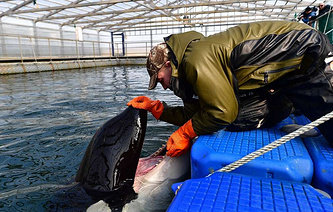 Eleven orcas had been kept for sale to China in the facility in Srednyaya Bay along with 90 beluga whales. However, three beluga whales went missing, and one orca reportedly disappeared. Police are carrying out an investigation. A criminal case has been launched into illegal hunting of these mammals. The scientists stress that the condition of these whales "is poor and declining." They referred to the conclusions of biologists and veterinarians, who compared an orca in photos taken 42 days ago. Earlier, Russian President Vladimir Putin instructed the Ministry of Natural Resources and Environment and the Ministry of Agriculture together with scientific organizations to come up with a solution to the problem. The Ministry of Natural Resources vowed to draw up a roadmap on the mammals’ release. The Kremlin administration is controlling the situation. Earlier, an expert team was set up to assess the mammals’ condition, consisting of scientists, veterinarians and staff members of special organizations with work experience.